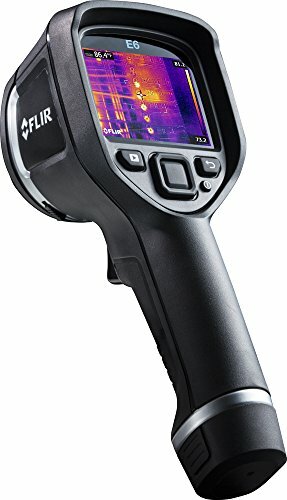 The FLIR E6-NIST is a compact infrared thermal imaging camera with a 3" color LCD, a -4 to 482 degrees F (-20 to 250 degrees C) temperature range and outstanding thermal accuracy (+/- 2% or 2DegreeC) powered by a rechargeable lithium battery and a certificate traceable to NIST. Spot measurements and JPEG images storage to the internal camera memory. The included software allows you to make professional detail reports and USB cables make saved images and data easy to navigate, view and use. With Area Box Measurement mode, Picture in picture image and Manual level and span thermal tuning functions. The E6 also provides FLIR's exclusive MSX (Multi-Spectral Dynamic Imaging) technology, which uses visible details from digital camera photos to create sharper IR images. The E6 boosts the measurable pixels to 19,200. FLIR's exclusive Double Diamond protection covers the whole camera for 2 years, the battery for 5, and the detector for 10 full years. Complete with certificate traceable to NIST, power supply/charger with four plugs, rechargeable battery, FLIR Tools software, USB cable, and hard transport case.